BePro Desktop is the best solution for travel agents. Book multiple services in one place!. We integrated more than 27 Online suppliers. Web base software for travel agents includes all services in one place, and saves time for your travel agent in sales process. * Search for two destination at the same time. * Ability to book up to 3 different rooms in one reservation. * Get results by the client's budget. * Not only search by city, with Bepro you can search by airport, landmark and specific address! * Google map, give your client direction report from our system! No need to open google map in a different browser. * Proposal - With Bepro you can give your client proposal for two destination or more. * Supports in multiple currencies. * Manage reservations, online cancellation, and request for changes. We give you the option to book a large amount of room a few months in advance. Selling packages to rock concert, football game or just nice package to an exotic location that you can't get hotel agreement. 95,000 hotels in 11,000 destinations, 190 countries across UK, West Europe, East Europe, Middle East,the United States, Canada, Central America, Latin America, Asia, Far East, South-East Asia, Africa and Australia. SPECIAL TOURS Wholesalers® Ltd is a global tourism supplier, offering its services exclusively to Travel Agents, Tour Operators and Airlines. Skilled and highly experienced staff is always available to assist you on any inquiry you may have, always aiming at the best possible service. Travco is a leading global hotel wholesaler. Our core business focus is supplying hotel accommodation to the travel trade. By cooperating with thousands of international hotels we are able to offer an outstanding selection of global hotel accommodation at the lowest rates. Hotelbeds accommodation & destination services is a leading receptive and business to business provider of incoming travel services to travel trade professionals worldwide. Serving over 2,500 resorts across more than 80 countries, 1.200 travel organizers put their trust in Hotel Bed’s local expertise to deliver high quality ‘in-destination’ services to more than 5 million of their clients annually. Tourico Holidays is the fastest growing worldwide wholesale travel provider with more than150 international distribution websites, more than 23,000 merchant hotel agreements, and operating globally. Gulliver's Travel Associates (GTA) is one of the world's leading wholesalers of hotels, ground products and services to the travel industry. GTA have been scouring the globe for 31 years to create a vast inventory of hotels and unique ground travel products and services for our partners and clients. GTA supplies tour operators, travel agents and public websites in 120 countries with everything their customers could possibly need to create exceptional travel experiences. Interface to Amadeus, Sabre, Galileo. With Bepro Desktop it's so easy to book flights. You can give your customer flight quote very quickly and with no effort. 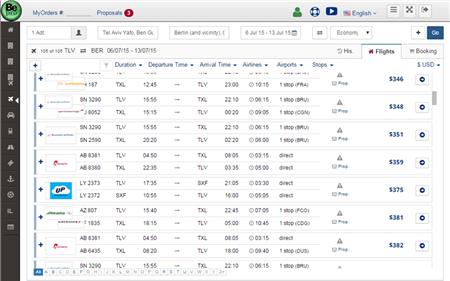 View flight rules in one click. Ability to add flights to proposal in one click! With Bepro desktop it's so easy to book multiple services in one click.Maximum flexibility in booking multiple services Flights and hotels don’t have to be on the same date! Give your client proposal in one click for multiple services! Give your client the perfect solution to get from the airport to hotel. Our suppliers has shuttles and also private cars. By Rail Europe. All European trains in one place! Ability to book one way & round trip in one click. Now agents can book cruises with no effort and no need to call cruise company!